Yes, this tastes as good as it looks. Shown here with gluten-free brown rice penne from Trader Joe's. I'm committed to eating a vegan diet because I love how I feel when I don't eat dairy--or meat of course (but meat's not a temptation for me.) Doing without Alfredo sauce, however, is a bit of a sacrifice. 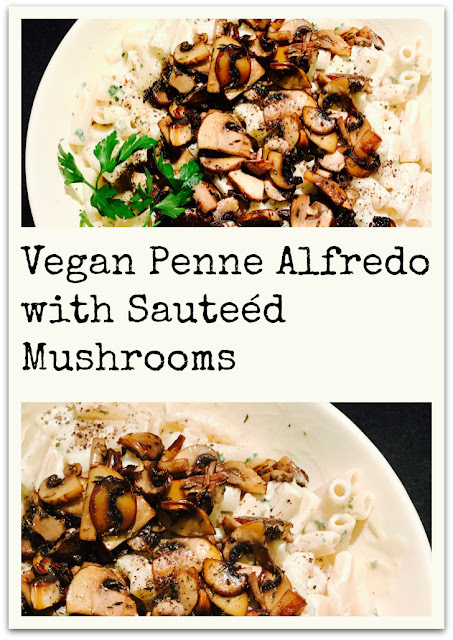 Or was, until I modified a sauce recipe I found on Simpleveganblog.com and came up with the creamiest, most Alfredo-like dish I could have ever hoped for. I haven't had dairy since June 2015, but to my palate this is so close to how I remember mushroom Alfredo I am in heaven every time I make it (about once a week at the moment.) Browned garlic, steamed cauliflower, and creamy canned coconut milk combine to make a dreamy delicious white sauce that sets off the earthy caramelized mushrooms and will have you going back for more. Go ahead and indulge--you're basically eating vegetables with a splash of coconut milk over a bed of brown rice. Sauté the mushrooms in hot olive oil over medium high heat. Sprinkle in the thyme and salt while the mushrooms cook, and let them sit without over-stirring if you want them to get really caramelized and brown around the edges. Set aside. Sauté the garlic in olive oil until browned (I brown it pretty dark because it really adds that pungent cheesy flavor to the blended sauce.) Turn down the heat a little and pour in your coconut milk (fast because it will sputter in the hot oil worse if you pour slowly,) bring it to a boil, then add the cauliflower chunks. Add the salt and pepper and simmer gently with the lid on for 7 to 10 minutes, until the cauliflower is steamed through and soft. Transfer the hot mixture to a high-speed blender, and add the nutritional yeast flakes and the lemon juice. Blend on high for 30 seconds to one minute, then check the creaminess level. Keep blending 20-30 seconds at a time until it's perfectly silky and smooth. (In my Vitamix, it only takes about 30 seconds to perfection.) If it's your first time making this sauce, you might want to taste it for salt level as well and adjust that before you take it out of the blender. 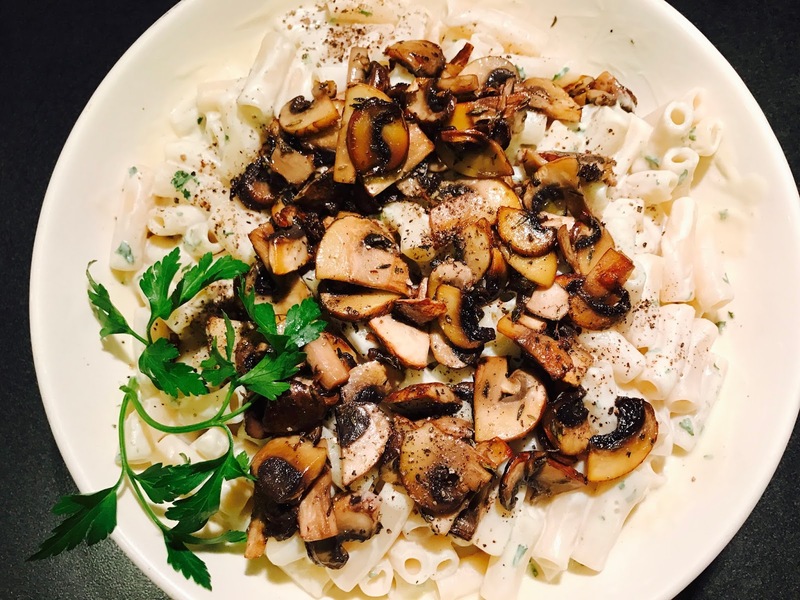 Pour the sauce over the pasta, top with the mushrooms and a generous sprinkle of fresh ground pepper. Garnish with parsley if desired, and enjoy! If you make this dish, let me know what you thought in the comments below!